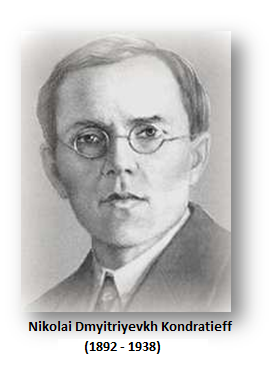 Nikolai Dmyitriyevich Kondratieff (1892-1938) was a Russian economist. Following the 1917 Russian Revolution, Kondratieff was an economics professor who was called upon by the new government to create the first Soviet Five-Year-Plan. Kondratieff was thus given the opportunity to draw the economic plan for Russia he assumed upon a blank slate. Kondratieff explored the past to gather empirical data upon which to construct the new economy. What he observed was the cyclical nature of society through its booms and busts, and that knowledge would later cost him his life. Kondratieff published in 1926 his conclusions after investigating history. He entitled his work, “Long Waves in Economic Life.” Kondratieff discovered that there were progressive wave formations running the span of 50 to 60 years in length. He was reviewing the time span beginning with 1789 up to the date of his publication in 1926. He described three great waves with highs about 1820, 1864, and 1920 that were closely linked to wars. However, we must also keep in mind that during this time period, the economy even in the United States was largely about 70% agrarian. Even by 1929, the United States was still about 40% agrarian. This naturally provided an undertone to his work. 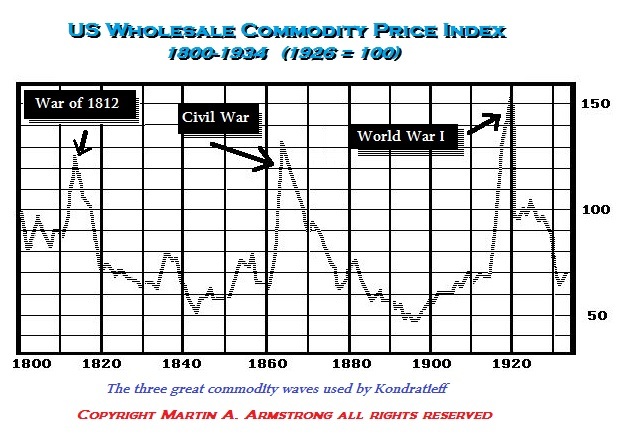 Even without war, adding the maximum time frame of 60 years to 1920 brings us to 1980, the peak in OPEC oil and gold. Kondratieff effectively reached his conclusion that the economy was driven by cyclical activity and thus this was implicitly against Hegel and Marx insofar as that the new government would not be able to reach some perfect state of synthesis. For this reason, Kondratieff’s work was seen as a criticism of Stalin’s goals. He was arrested in July 1930 and accused of being a member of a non-existent “Peasants’ Labour Party” and he was sent to prison for 8 years. Stalin wanted him dead and expressed that in a letter dated August 1930. When his 8 year sentence was complete, he was put on trial again with new charges during the “Great Purge” and sentenced to 10 years in prison. However, upon sentencing September 17th, 1938, he was taken outside and then shot to death at the age of 46. Kondratieff died for his research as a political prisoner for his research was something that the government did its best to destroy and to prevent from influencing anyone. Kondratieff’s work was compelling and contributed greatly to the Austrian School of Economics that first began to develop the concept of a Business Cycle. The general central principle of the Austrian Business Cycle Theory is concerned with a period of sustained low-interest rates and excessive credit creation results in a volatile and unstable imbalance between saving and investment. Within this context, the theory supposes that the Business Cycle unfolds whereby low rates of interest tend to stimulate borrowing from the banking sector and thus then results in the expansion of the money supply that causes an unsustainable credit ­source boom which leads to a diminished opportunity for investment by competition. Therefore, at the top, this causes speculative misallocation of resources that manifests into a bubble-top. The decline unfolds as a “credit-crunch” creating the speculative bust and recession. This contraction in credit shrinks the money-supply completing the cycle to return to its prior state. The usual criticism of Kondratieff’s work has been the absence of any empirical cycle that is symmetrical. This was the criticism of Mitchell who argued that since economic crisis did not appear with clockwork regularity, then any “reoccurrence is plainly mistaken.” It is true that the cycle discovered by Kondratieff was by no means symmetrical when there were only three waves that varied from 50 to 60 years. However, this expectation of rhythmic perfection illustrates the lack of understanding about cyclical wave structures. Such perfect waves with regular intervals are known as a Transverse Wave whereas waves that differ in wavelength (distance between peaks) are known as a Longitudinal Wave. We will examine these two types of waves later on. It is sufficient to state at this time, that these are two fundamentally different wave structures.